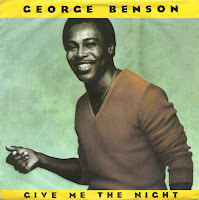 'Give me the night' was the title track of George Benson's 1980 album. The song was written by Rod Temperton, who would go on to work with people like Aretha Franklin, Michael Jackson, Donna Summer and Kim Wilde. When it was released as a single, it was Benson's most successful single up to that point, peaking at number 7 in the UK singles chart and number 8 in the Dutch Top 40.